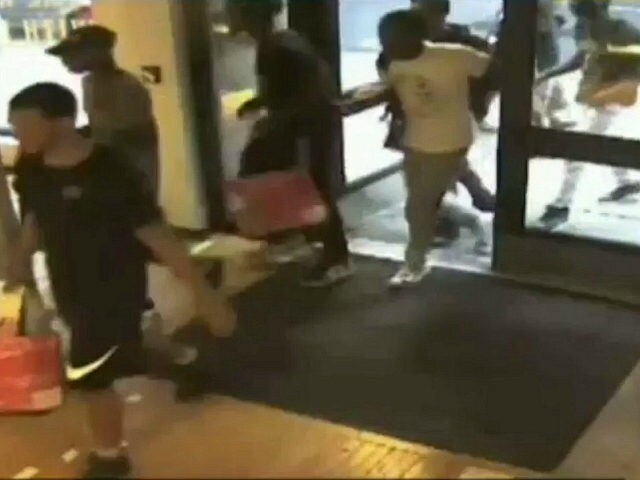 The New York Police Department (NYPD) released surveillance video this week of a flash mob of thieves allegedly stealing thousands of dollars worth of goods from New York City sneaker stores. The alleged gang of about ten thieves robbed several stores on at least three separate occasions since June, the Daily Mail reports. Authorities say the men appear to be in their late teens to early 20s, have stolen goods from a Nike store and a Jack Rabbit store, and took at least $2,500 worth of merchandise each time. The surveillance video shows the flash mob barging into the store with shopping bags, grabbing items, and fleeing the store. Residents who heard about the crime sprees say it was “shocking” to hear that these incidents would take place in their neighborhood. Police say the men have been able to carry out these robberies because of their strength in numbers. Authorities believe that the thieves stole about $2,000 worth of merchandise from the Jack Rabbit store on Third Avenue on June 20 before fleeing, $1,200 worth of goods from the Nike store on Third Avenue on July 10, and $2,500 worth of items from that same Nike store July 14. The NYPD asks anyone with information on the suspects to call Crime Stoppers at 800-577-TIPS.